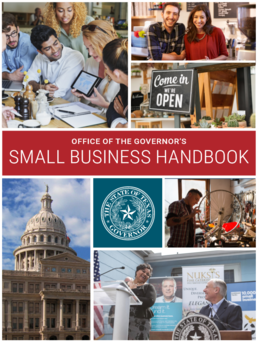 The Governor's Small Business Handbook Is Now Updated - And Online! The Small Business Handbook provides in-depth information on starting a business in Texas including information on business formation, employee requirements, taxes, and business financing. Also included, is information on programs and resources available to entrepreneurs and small business owners to help them start, grow and scale their business. To find other available resources, visit their website.